Pendulum Effect:- Once per turn, when a "Performapal" monster you control is destroyed by battle: You can target 1 "Performapal" or "Odd-Eyes" card in your Pendulum Zone; Special Summon it. Monster Ef..
Pendulum Effect:- When an opponent's monster declares a direct attack while you have a card in your other Pendulum Zone: You can destroy the card in your other Pendulum Zone, and if you do, Special Su..
Pendulum Effect:- Once, while this card is in your Pendulum Zone, when an "Odd-Eyes" monster you control declares an attack: You can target 1 other "Performapal" monster you control; that attacking mo..
Pendulum Effect:- Once per turn, when an opponent's monster declares an attack: You can Tribute 1 "Performapal" monster; negate the attack, then end the Battle Phase. 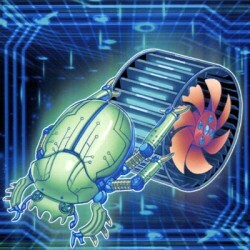 Monster Effect:- If a "Performapa..
You can banish this card from your Graveyard; Special Summon 1 "Speedroid" Tuner monster from your hand or Graveyard, except "Speedroid Den-Den Daiko Duke". You can only use this effect of "Speedroid .. If this card is Special Summoned: You can target 1 "Lunalight" monster you control, except "Lunalight Blue Cat"; its ATK becomes double its original ATK until the end of this turn. You can only use th..
You can send this card from your hand or field to the Graveyard, then target 1 "Lunalight" monster you control; it gains 1000 ATK until the end of this turn. You can banish this card from your Graveya.. When this card is Normal Summoned: You can target 1 "Lunalight" monster in your Graveyard, except "Lunalight White Rabbit"; Special Summon it in Defense Position. Once per turn: You can target Spell/T..
You can discard this card, then activate 1 of these effects:- Add 1 "Lunalight" monster from your Graveyard to your hand, except "Lunalight Black Sheep". Add 1 "Polymerization" from your Deck to your ..
Pendulum Effect:- You cannot Pendulum Summon monsters, except "Lunalight" monsters. This effect cannot be negated. Once per turn: You can Fusion Summon 1 "Lunalight" Fusion Monster from your Extra Dec..
Pendulum Effect:- Once per turn: You can target 1 "Lunalight" monster in your Graveyard; Special Summon it, but it cannot attack, its effects are negated, also it is destroyed during the End Phase. Mo.. Cannot be used as an Xyz Material for an Xyz Summon, except for the Xyz Summon of a Winged Beast-Type monster. If this card is in your hand: You can target 1 "Raidraptor" monster you control that has ..
Once per turn, during the End Phase, if this card is in the Graveyard because it was sent there this turn: Take 1000 damage. When this card is Normal or Special Summoned: You can target 1 "Blackwing" ..
(This card is always treated as a "Blue-Eyes" card.) This card is treated as a Normal Monster while in the hand or Graveyard. When this card is Normal or Special Summoned: You can target 1 Spell/Trap .. When this card is Normal Summoned: You can Special Summon 1 Level 1 LIGHT Tuner monster from your hand. You can target 1 Effect Monster you control; send it to the Graveyard, and if you do, Special Su.. When this card is Normal Summoned: You can add 1 Level 1 LIGHT Tuner monster from your Deck to your hand, except "Sage with Eyes of Blue". You can discard this card, then target 1 Effect Monster you c.. When this card is Normal Summoned: You can target 1 Level 1 LIGHT Tuner monster in your Graveyard; add it to your hand. You can shuffle this card from your Graveyard into the Deck, then target 1 Effec..
Once per turn, during the End Phase, if this card is in the Graveyard because it was sent there this turn: You can Special Summon 1 "Blue-Eyes" monster from your Deck. You can banish this card from yo..
Pendulum Effect:- Negate the effects of face-up Pendulum Monsters while your opponent controls them. Monster Effect:- At the start of the Damage Step, if this card battles a Pendulum Monster: Destroy ..
Pendulum Effect:- While you control an "Amorphage" monster, monsters cannot activate their effects, except "Amorphage" monsters. Once per turn, during your Standby Phase, Tribute 1 monster or destroy ..
Pendulum Effect:- While you control an "Amorphage" monster, neither player can activate Spell Cards or their effects, except for "Amorphage" cards. Once per turn, during your Standby Phase, Tribute 1 ..
Pendulum Effect:- While you control an "Amorphage" monster, neither player can activate Trap Cards or their effects, except for "Amorphage" cards. Once per turn, during your Standby Phase, Tribute 1 m..
Pendulum Effect: While you control an "Amorphage" monster, neither player can activate cards or effects as Chain Link 2 or higher. Once per turn, during your Standby Phase, Tribute 1 monster or destro..